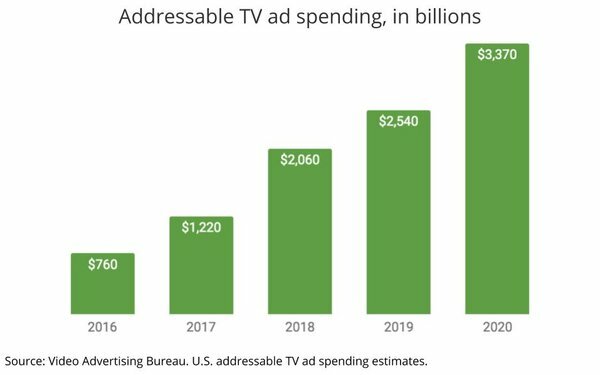 U.S. addressable TV spending is expected to rise 33% next year to $3.37 billion from $2.54 billion in 2019, according to the Video Advertising Bureau. The report estimates 54% of all TV homes are addressable TV homes -- 64 million -- can receive targeted TV advertising. This is up from 49.8 million addressable homes in 2016. Nielsen says there are a total of 119.9 million U.S. TV homes. The VAB says this amounts to an addressable TV audience -- those 2 and older -- of 162.2 million, which has grown 27% over the past two years. Data comes from Comcast’s FreeWheel. Research includes cable and satellite set-top boxes and video-on-demand (VOD) services, and does not include connected TV, smart TV and over-the-top (OTT). Total addressable TV viewing, in terms of ad minutes viewed, is projected to rise 25% by 2022 (from 2016) -- with 14% of all ad viewing going to online video addressable TV; 9% to time-shifted addressable TV; and 7% to addressable linear TV. The VAB estimates that 55% of U.S. addressable TV agency and marketing professionals are planning to increase future spending. Some 15% of advertisers are now including addressable TV in their buys on a regular basis; with 35% having “experimented” with it. The report says addressable advertising is more important because of continued TV viewing fragmentation, noting that 51% of total TV time with ad-supported cable TV now occurs outside the top 20 TV networks. Major addressable TV home providers include Comcast Corp, AT&T’s Xandr (DirecTV), Dish Network, Charter Communications (VOD), Cox Communications, Altice USA and Verizon.